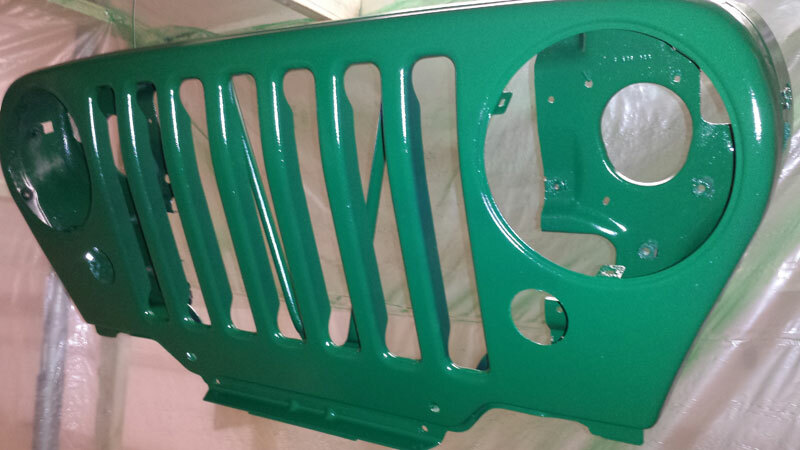 With the rear end of the getaway Jeep complete, it was finally time to take a look at the front. 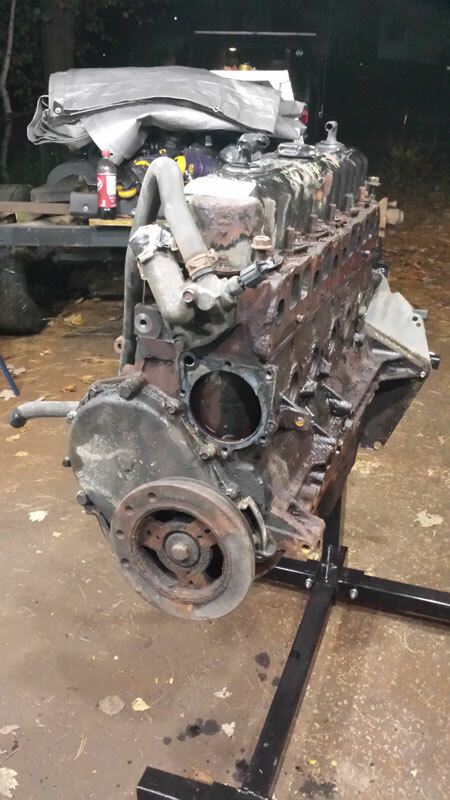 The first step was to clean up the rust, put down a coat of Por15 to seal up the frame from future issues, and install a motor mount lift. This moves the engine up an inch higher than stock giving me a little more ground clearance to the oil pan and re-aligning the fan with the radiator. 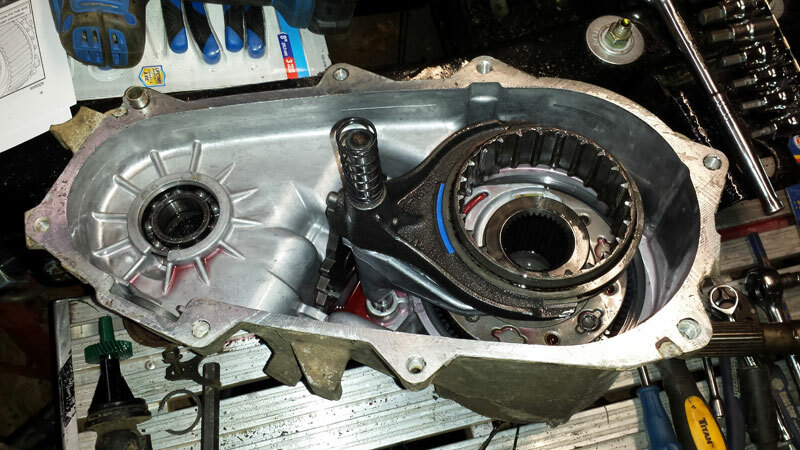 More importantly to me though it changes the angle of the transfer case output and the rear driveshaft geometry, hopefully warding off drivetrain vibrations that sometimes come with a lifted Jeep. 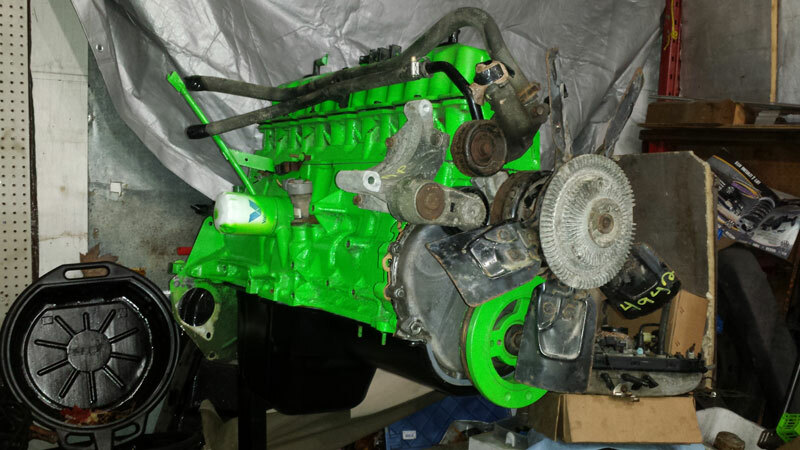 I’m hoping that with a mild 2-1/2″ lift and this tweak I’ll be fine and at least for now avoid the additional expense of a slip yoke eliminator and carden joint drive shaft. If you’ve been following the build, you already know that I had some serious issues with the steering gear box mount, but there were some other hang ups along the way as well. 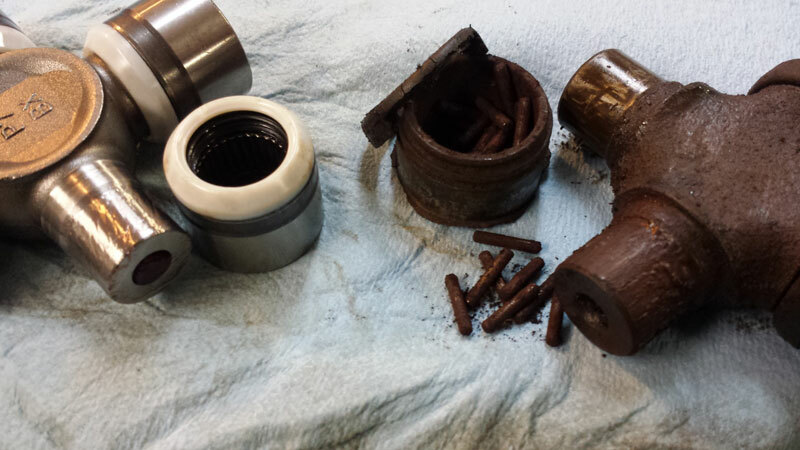 During the tear down I noticed one of the front axle shafts was nearly seized solid. I already had plans to replace all the u-joints anyways, but this sealed the deal, doubly so when I pulled what was left of the old bearing out. Of course though, even this relatively simple job had to fight me. With several weeks of back order waiting on the u-joints, I thought I had it made when they finally arrived. That was until I went to install them and one of the axle shaft joints only came with three of the required four c-clips. I made some calls to the local truck and auto shops to no avail – the only suggestion I received was to order another unit and wait on that all over again. Impatient, I bought a no-name u-joint thinking that I could just use the clips in the quality unit that I had ordered, only to find that the no-name joint used ever so slightly different specs – the c-clip was 0.7mm smaller and would not fit. Finally I tried placing a call to Dana Spicer – the manufacturer – who were so sorry for the mix-up that they couriered a replacement over night from Tennessee. But just to get in a final dig, Fedex managed to screw up the final delivery and instead of arriving at my door I had a two hour drive to pick up the final part – a part with a value of a whopping eleven cents! 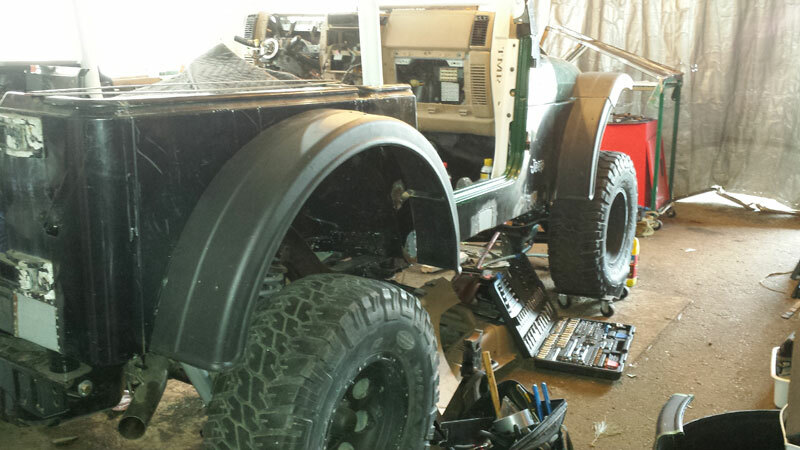 With the axle shafts ready to go, I finally turned to re-assembling everything on the front end. 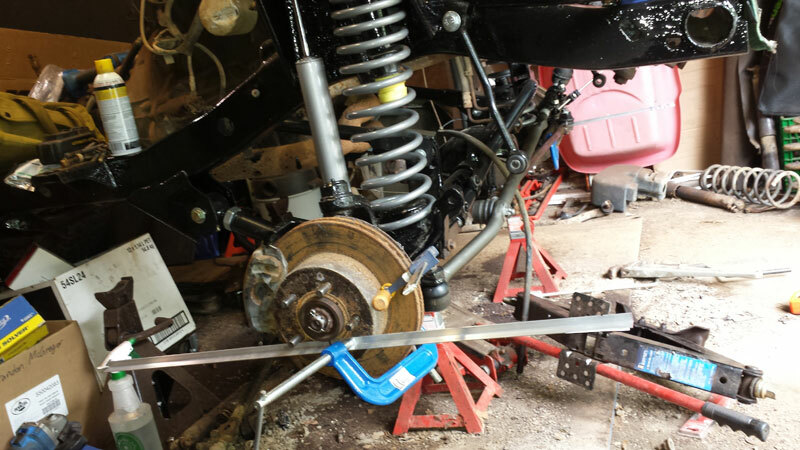 I used the same basic method to install the front axle as I did the rear – centring the axle on the bump stops, aligning it to point straight with the frame, setting up the bump stop height against the shock travel, and then re-checking the first two adjustments. That’s when things went sideways though. Every time I cycled the axle through it’s travel it seemed to move forward, as though the control arms had grown and the bump stops where now out of alignment. It didn’t make any logical sense since nothing had changed. So I installed the track bar to keep the axle in more precise alignment, only to find that the mounting bracket on the frame side now hit the differential cover, scraping a layer of fresh paint off it in the process. Thankfully the bracket was heavily over-engineered and even after removing some material from it to create the clearance I needed I’m still certain the cast factory part it’s mounted to will fail first. 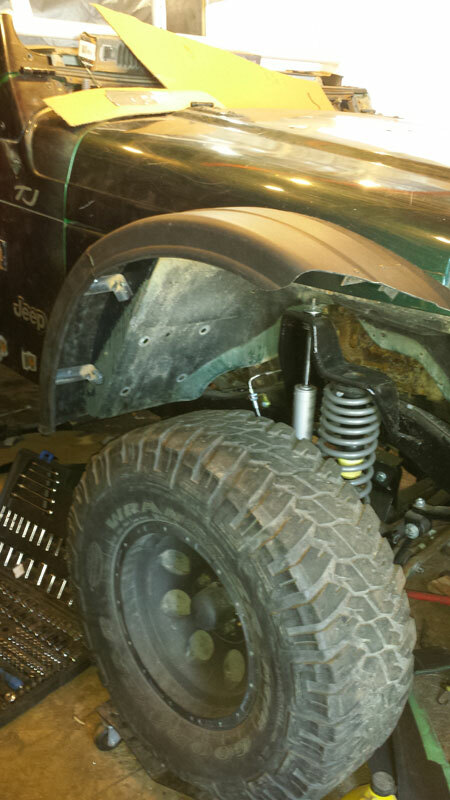 With all that sorted, the springs were installed as well as the axle shafts, wheel bearings and brakes. For now the original brakes are remaining in place as those are parts that are prone to rapid deterioration and I can’t be certain yet the chassis won’t be sitting some time while the body is prepped, but those parts will all be evaluated and replaced as needed before the Jeep gets saftied for the road. Now it was on to the steering bits. 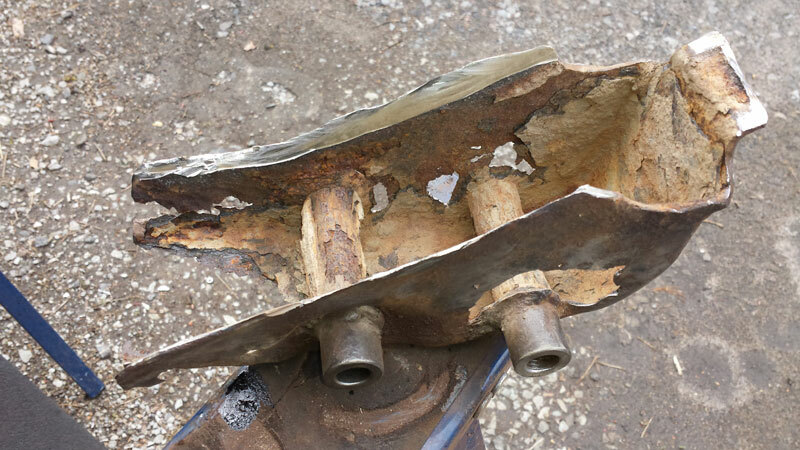 After having witnessed first hand the effects of a bad case of ‘death wobble‘ – an issue with various causes almost all revolving around loose steering parts – I had decided to replace every last joint and tie rod end with top of the line, brand new pieces. I even decided to replace the tie rod itself even though there shouldn’t be anything wrong with the old one being simply a threaded tube and having no bends – it was the fact that I could get a brand new tie rod for only $35 and save breaking the rust loose on the old one that sold me. As it turned out, that was a bit of a mistake. 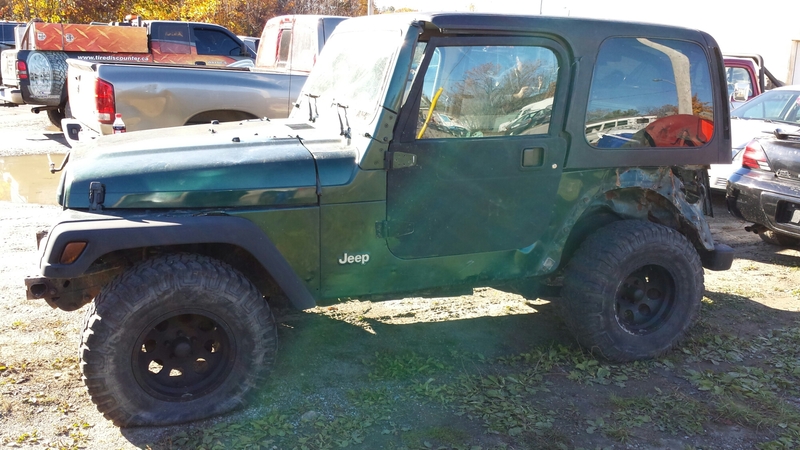 I got the tie rod through Crown Automotive – usually known for making good quality replacement parts for Jeeps of all ages long after Jeep themselves have discontinued the part. Unfortunately for me, for some reason or another the tie rod ends wouldn’t thread in to the new tie rod. They smoothly turned in about an inch then seized solid. Knowing that they couldn’t possibly be cross threaded after going in that far so smoothly I grabbed a wrench and forced the issue a couple more turns then removed the parts – sure enough it was eating the threads on the new tie rod end. I salvaged the original tie rod from the scrap pile, cleaned it up and sure enough the ends threaded in beautifully smooth without any issue at all. Turns out my shiny new tie rod had been threaded wrong from the factory. 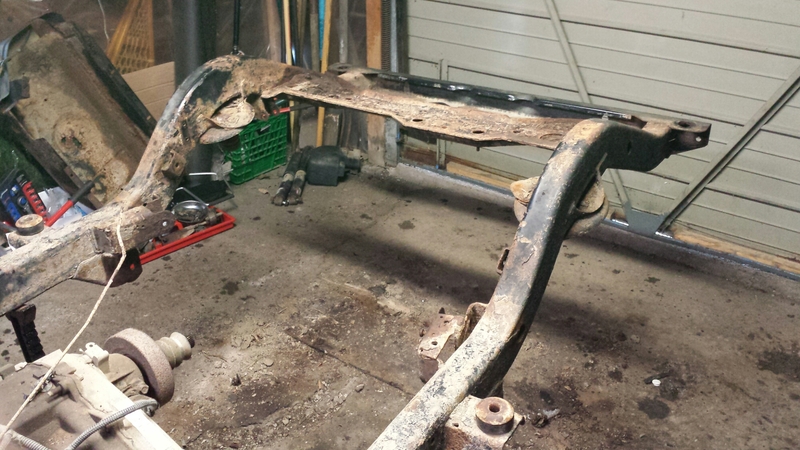 So let this be a warning to future builders – don’t trust the Crown TJ tie rod. Luckily my old one was still good and I only damaged about one and a half threads on the very end of one tie rod end so the parts are still more than strong enough, but so much for my completely shiny and new steering bits plan. Using some information I found online as well as a tip about using lengths of metal stock in place of tire for more accurate measurements, I did a basic alignment right in the garage before mounting tires. 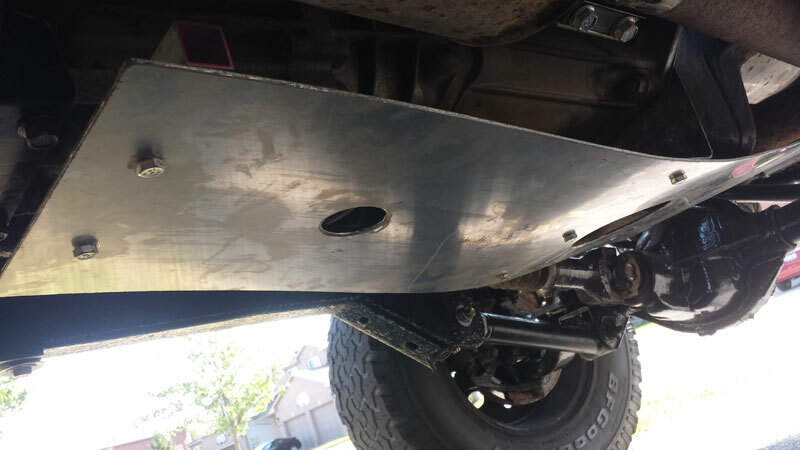 Some people online believe that this is just as accurate as a commercial alignment on a Jeep since the very nature of the truck is simple with few adjustments available. Either way I plan to have a commercial alignment done before the truck hits the road as having installed adjustable control arms in place of the factory units does give me control over the caster angle which can be measure more accurately with the commercial equipment. But it will be interesting to see how close this simple driveway alignment came to the real thing. If it’s within reason I know one more job that I won’t be paying someone else to do again. However on future attempts I’ll actually remember to bring better clamps instead of leaving them at home and I’ll use heavier metal arms as these ones required a little care to ensure they weren’t bending. 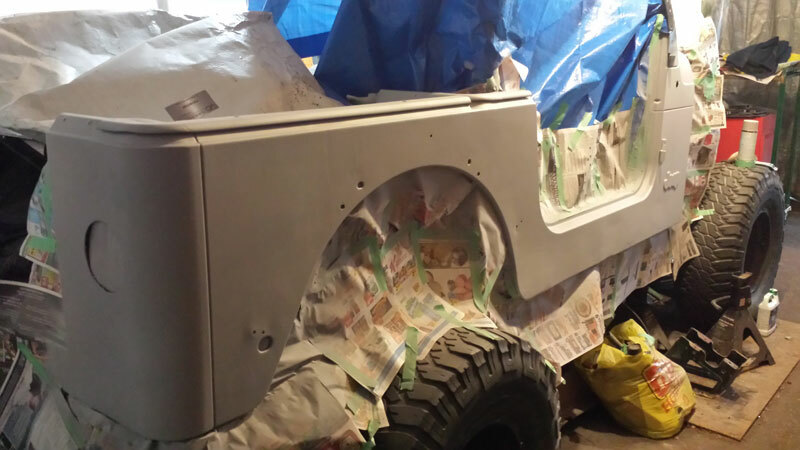 With that done, it was finally time to mount the front tires, take the truck down off the jackstands, and for the first time since starting this project ten months ago, the Jeep was finally standing on it’s own tires again. It seemed only right to push it out into the driveway and give it a bath, knocking months of accumulated rust and dirt off it. 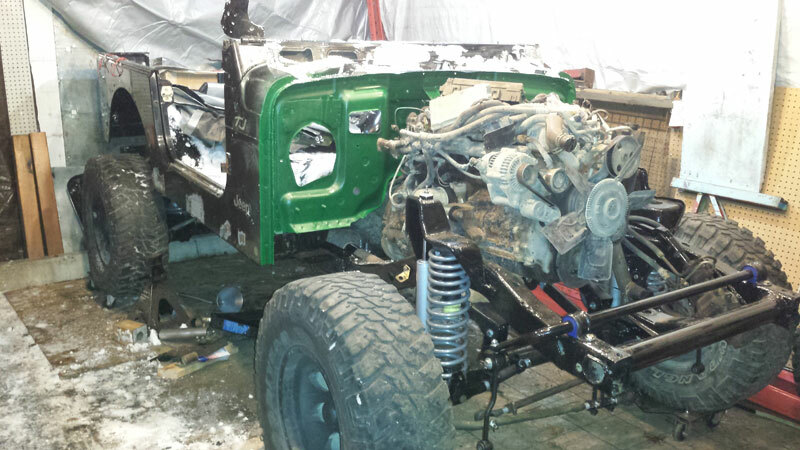 There are still a few more things to do, like run the fuel and brake lines, change the transmission and motor oils, bolt up the fuel tank and do some final setup on the steering assembly – but other wise this chassis is ready for a body to be mounted to it. I feel like this crazy project is finally reached a stage where it seems achievable. In the mean time, in it’s continued search for a name, I’ve taken to calling it ‘Project Wanderlust’ since every moment turning wrenches brings dreams of the remote places this rig will be taking me soon enough. We’ll see if the name sticks or not, but either way, one day this truck will be rolling it’s way up the Dempster Highway soon to connect right through to the Arctic Ocean at Tuktoyaktuk. The steering box had nearly ripped itself right off the frame. 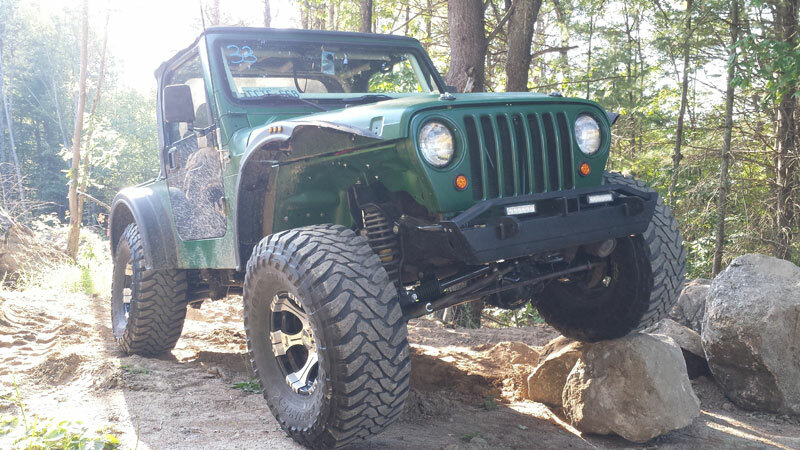 Some online reading makes it seem that this is a fairly common issue on CJ’s and YJ’s with oversize rubber and replacement steering box mounts and reinforcements are available right off the shelf – but for TJ’s there’s nothing. Is it a non-issue or am I just ahead of the curve? Of course some east coast salt in the mix doesn’t help things, but either way there’s now a real dilemma – what to do? First step was to hit things with a wire brush to see the extent of the damage. At that point it was obvious there was no fixing or patching the existing. I figured there might not be a solution off the shelf, but that didn’t mean that I couldn’t create one myself. I took some measurements then cut the existing mount off the frame. It was pretty obvious at that point I was going in the right direction. For one of the highest stress points on the frame, there isn’t much metal left there. What’s surprising is that this frame had recently been certified as safe in this condition. So I cracked out some of my recently dormant engineering background and designed the new mount. I had a friend with a high end machine shop who agreed to prototype out a new mount. The biggest dilemma to building the new mount was finding the solid bolt mounts with just the right inner diameter. They have to be open enough to let the bolt slide freely but tight fitting enough not to introduce play. Rather than try to find pipe with a 12.15mm inner diameter, we were able to just weld in solid rod then machine it to the exact inner diameter. That’s the only part stopping the backyard mechanic from taking this project on I think. 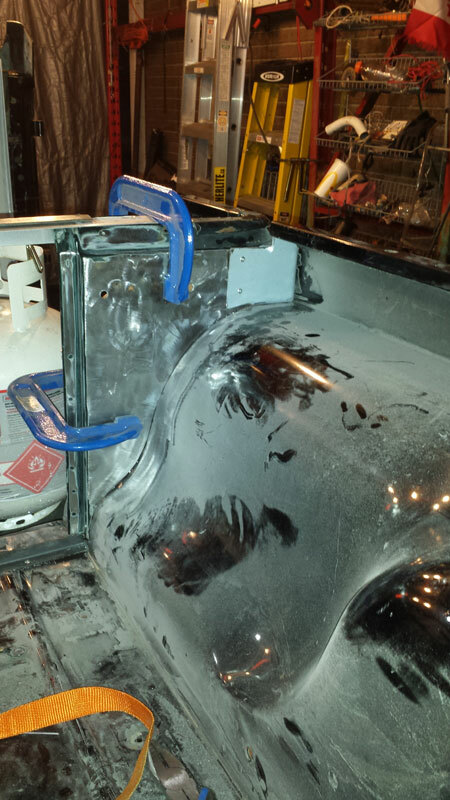 If one were really dedicated through they might be able to salvage the material out of the factory mount. 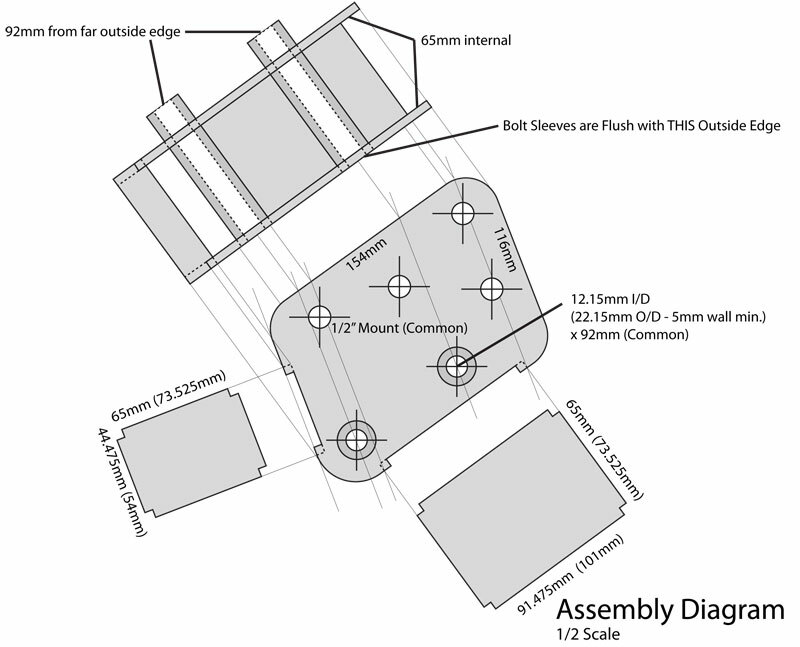 With that issue solved, the rest of the mount was designed with over-building in mind. 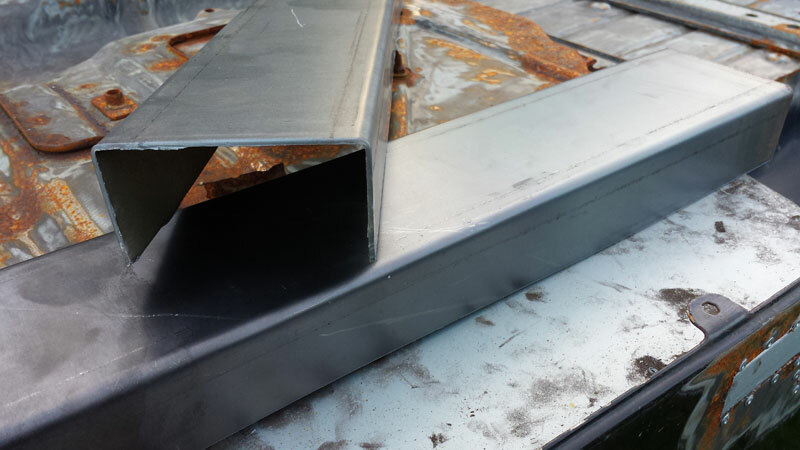 I spec’ed 3/16″ sheet throughout but it was actually built with 1/4″. We probably should have then recessed the bolt faces slightly, but I can tell you that the factory bolts are long enough to take up the excess – but you do have to compensate for the extra plate thickness in the length of the pipes supporting the bolt as their inside edge sets the steering box the right distance from the frame. 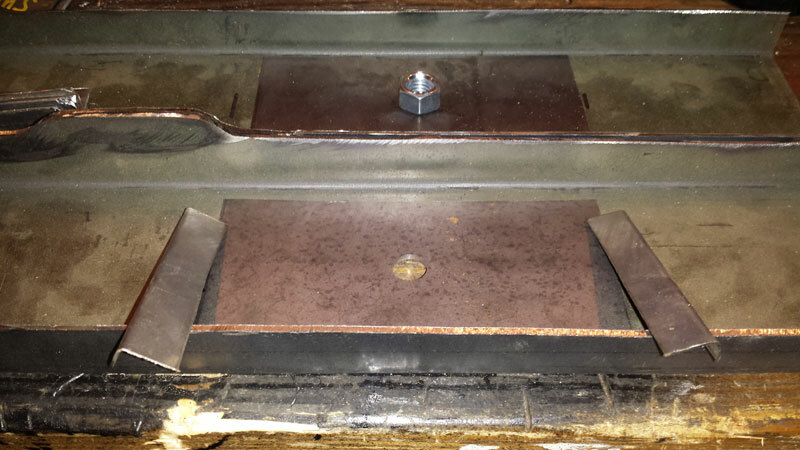 So if you add a 1/16″ to the plate size, also add 1/16″ to the length of those pipes from the outer mount face. I also made a point to leave the lower corner open to drain mud and water. 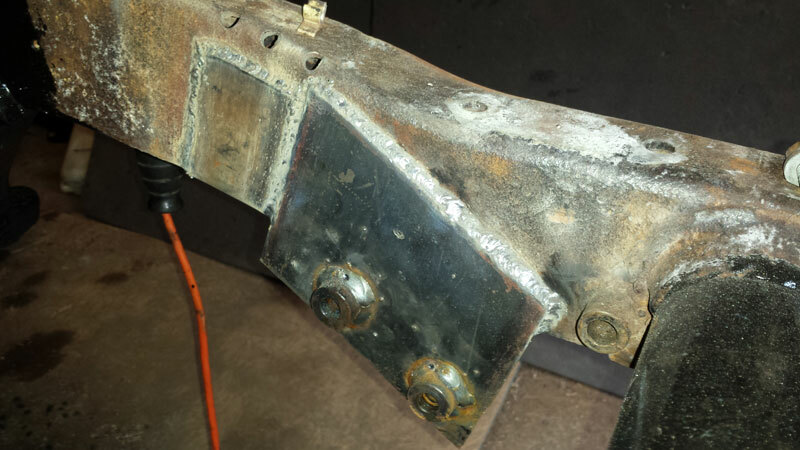 With the mount built – it was time to weld it in place. 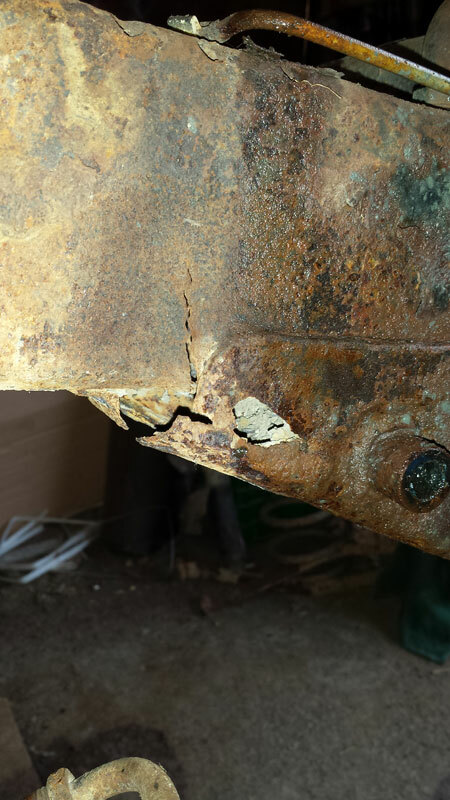 You’ll notice in the photos that there’s also some smaller plates welded to the frame – those are patches to reinforce the tear and the removed rust. With the new steering box mount now welded in place I think this is probably the strongest part of the frame. 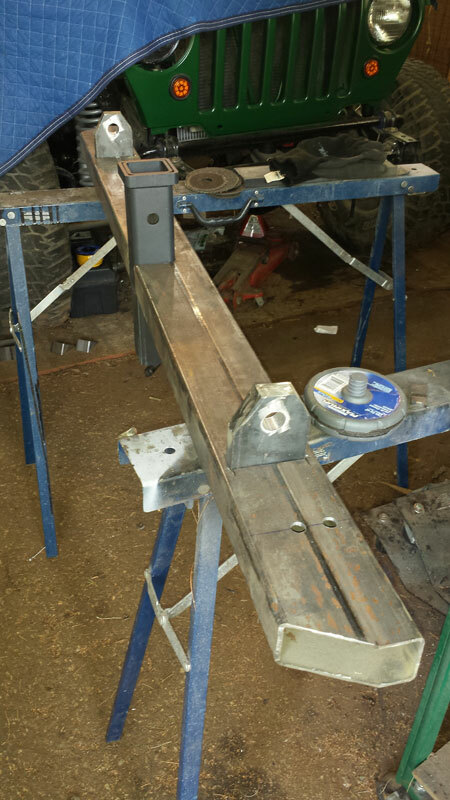 And just like that the frame is ready to go again – the steering box mount fits perfectly and I just need to trim off the lower corner so it doesn’t catch rocks. 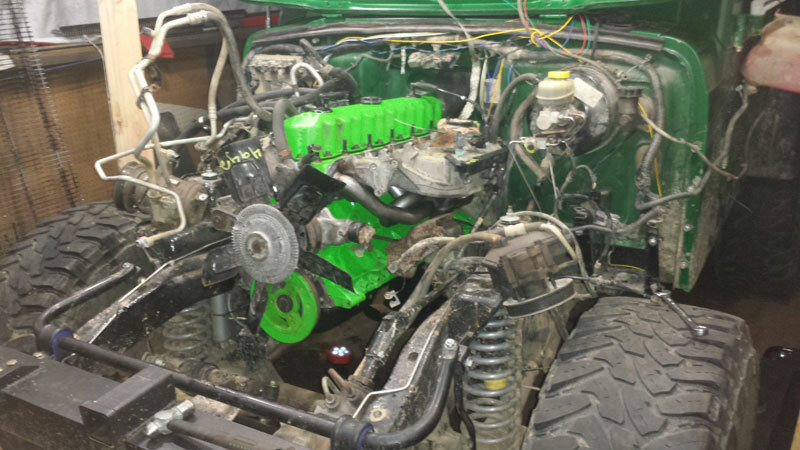 If you’re having a similar problem – download the steering box mount plans and build you’re own, or contact me to arrange to have one built. There was more than a little delay in this project, but things are moving again. 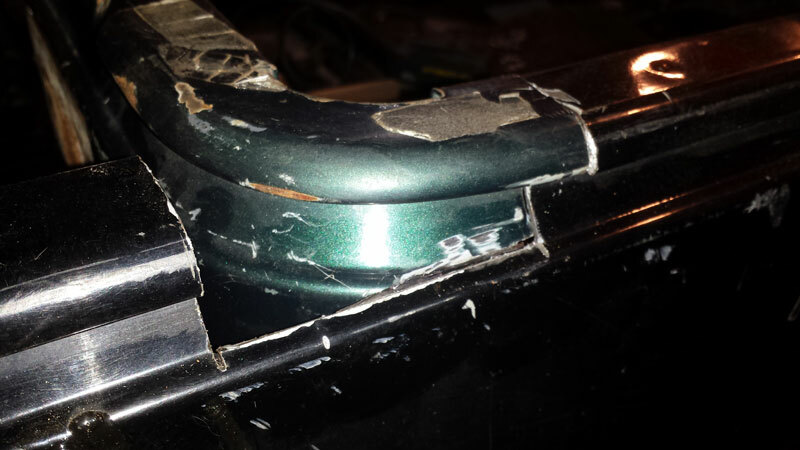 While wire brushing the frame I found some a weak spot hidden behind the frame mount for the lower control arm. I fabbed up a quick reinforcement plate, but since the shop I’m working in has some electrical issues I wasn’t able to plug in a welder. 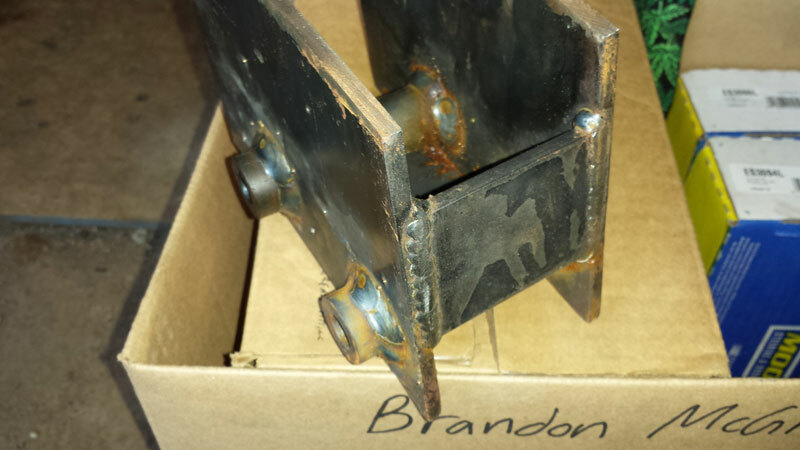 I had to wait on a guy with a portable welding setup who did some great work but took a while to connect with. 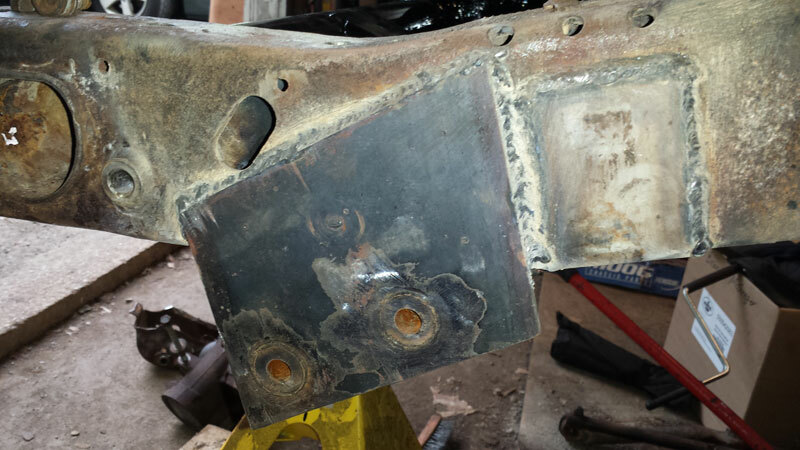 With that cleaned up though, I put in a drainage hole to prevent future issues and coated the rear half of the frame with POR 15 – a rust preventative and paint that’s supposed to be great and is looking very promising so far. 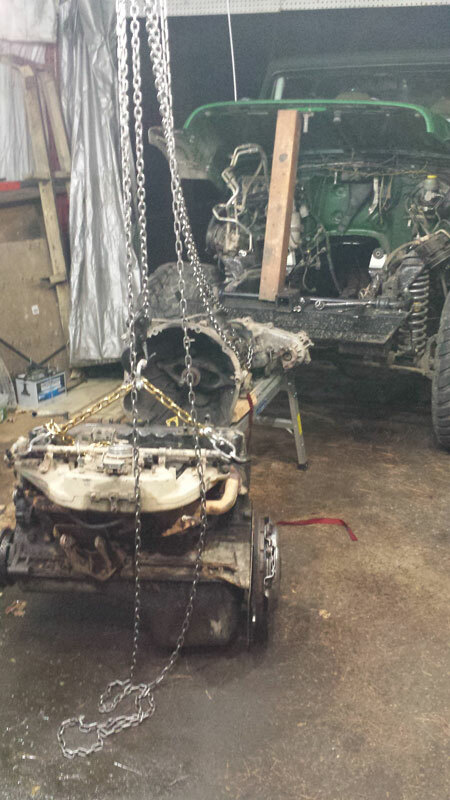 First up was to get the axle back into place – a job easier said than done. Choosing to go with more flexible and more tunable adjustable control arms adds some ability and precision to the truck, but adds more work. 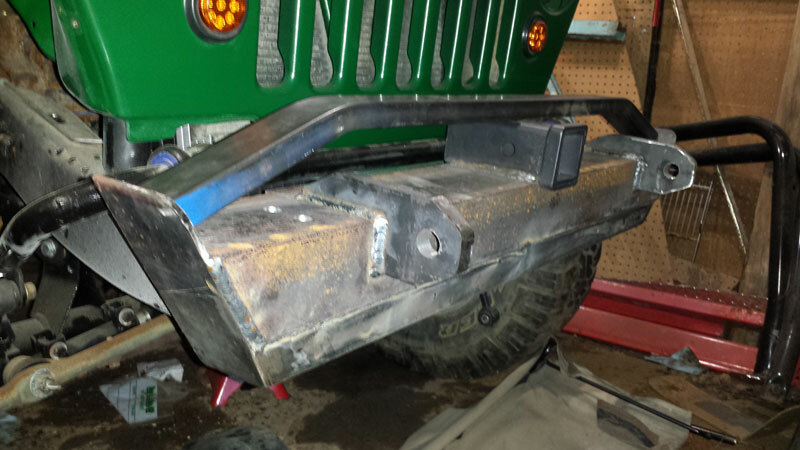 Instead of just bolting them in and hoping the Jeep engineers chose a correct enough length even after my modifications, the axle can be setup to the new correct location. First centreing the axle on the bump stops and squaring it to the frame, then setting up the bump stops to maximize the travel of the shocks without damaging them. One final step is to set the angle that the axle meets the driveshaft but can’t do so until I have the actual driving weight on the suspension. The final hiccup in the axle installation was the trackbar. Used to keep the axle in the correct location left to right. 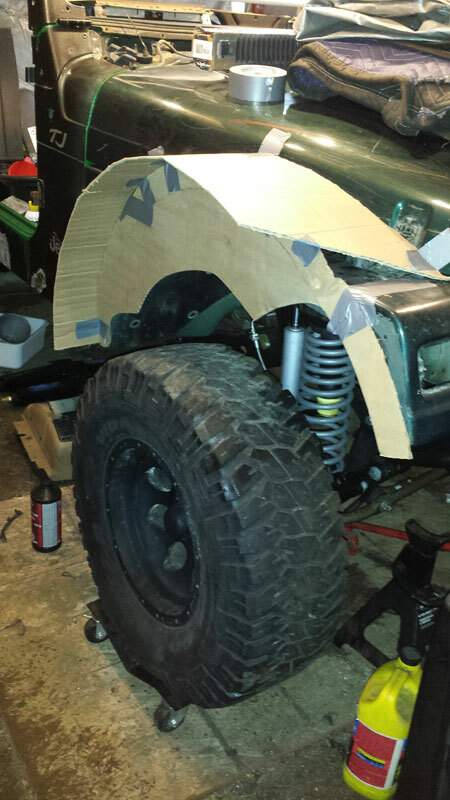 With the lift in place the trackbar needs to be relocated so that it’s fixed length holds the axle in the right place. 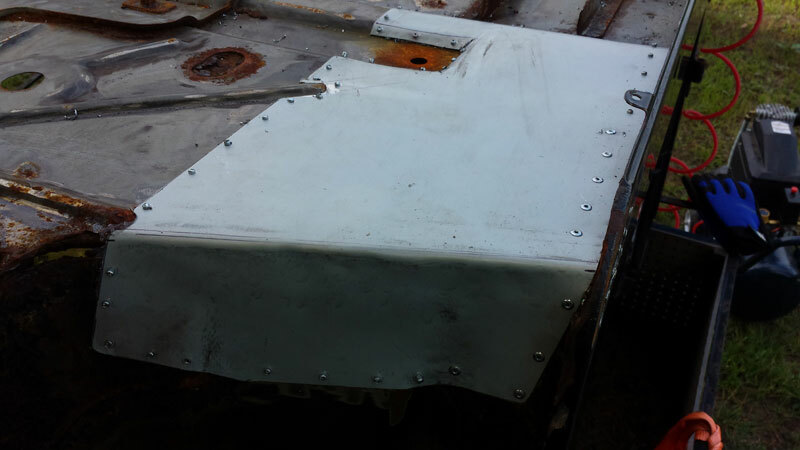 However that relocation moved the bar into contact with the frame rail that supports the fuel tank when the axle reaches only half it’s suspension travel. Of course a few months ago I passed on a new second hand adjustable rear track bar that would have solved this problem, but at the time I didn’t see the value in that – now I get to pay full price before putting the truck on the road – oh well. 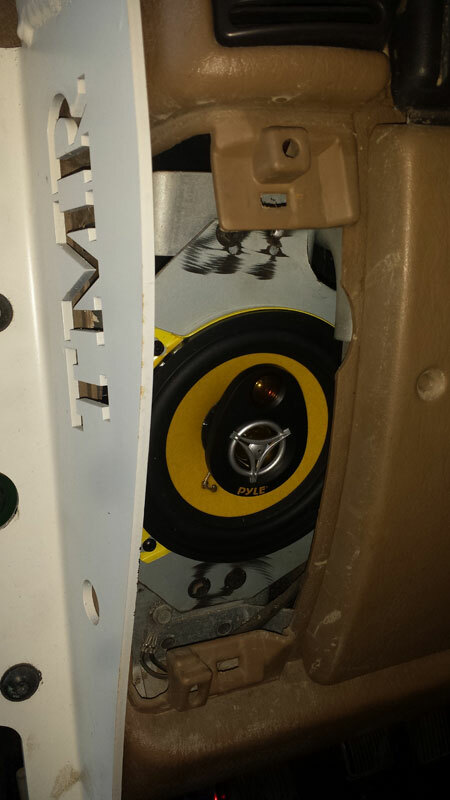 The next step was to bolt in the exhaust – a stainless steel system from MBRP that should last a good long time and happens to have a nice rumble to it without being too loud and seems to give a nice little power boost at the same time. This went fairly painlessly with only a small modification to move the rear most exhaust hanger from the outside to inside of the frame to give a touch of clearance around the after market shocks. 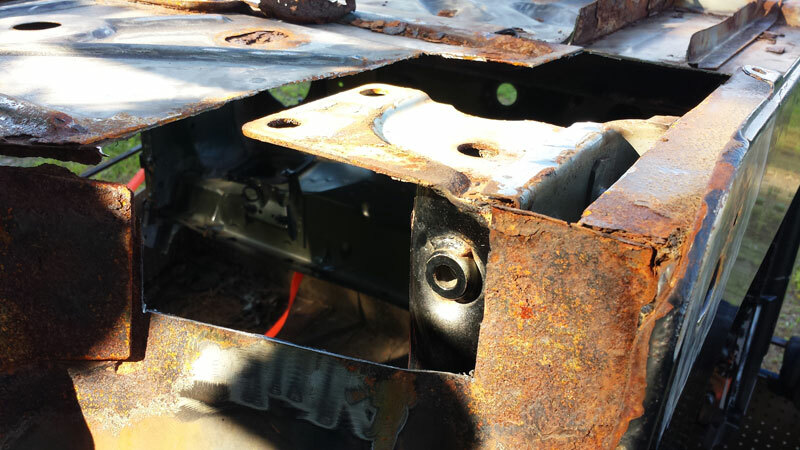 If you’re sharp and know Jeeps well enough you may have also noticed the bolts holding the transmission support/skid plate in place now go right through the frame. 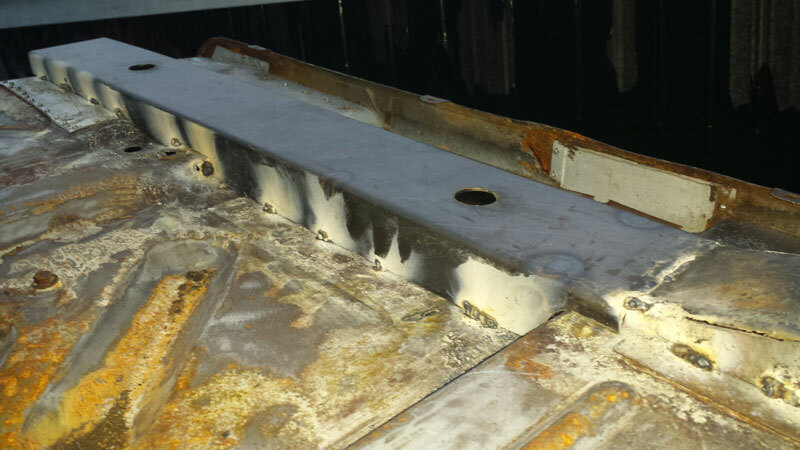 It’s a known weak spot that the existing bolts that secure to captive bolts inside the frame strip out. A quick and elegant solution I found online is to simply drill through the frame and use a longer bolt with a standard nut on the top side. These bolts are a little long and they were later replaced with shorter ones once I found them hardened to be strong enough, but given that I’m later installing a small body lift as well, adding more space between the body and frame, it probably would have worked anyway. 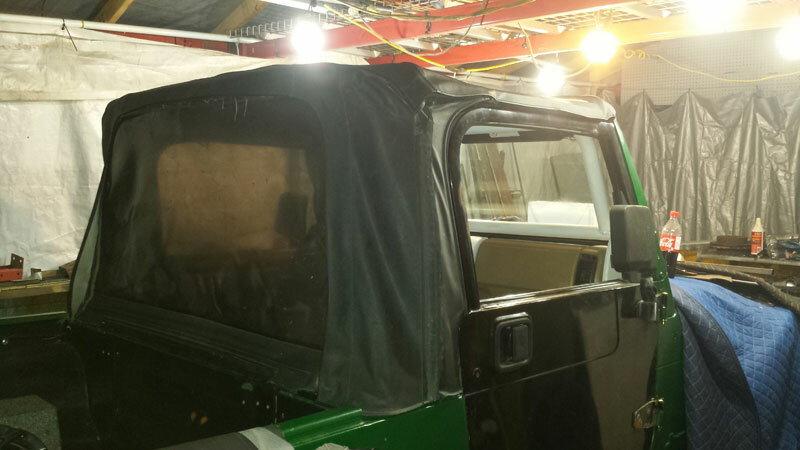 And with that I finally got to turn the truck around and start work on the front half. Yes, I skipped putting in the fuel tank as I’ll be using the tank out of my second, parts donor truck and there’s no need storing fuel in the garage in the mean time. 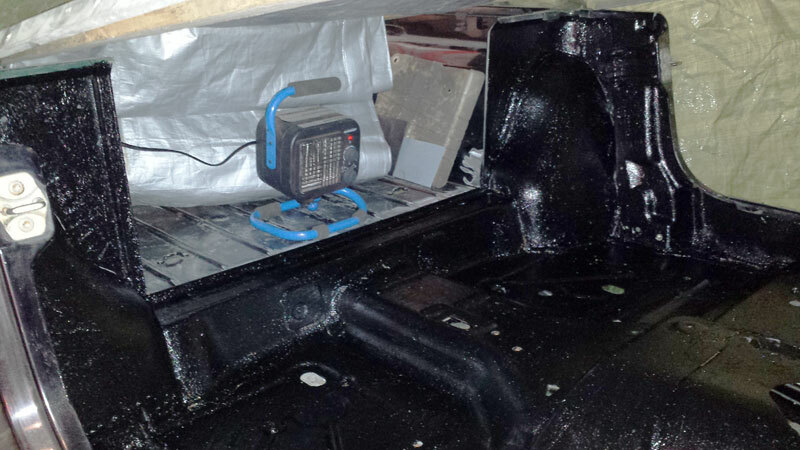 I also skipped running any of the fuel or brake lines yet as I have a bit of work to do to the body tub before it gets bolted in place. Should that work take longer than expected and this frame ends up sitting longer, I’ll want to re-evaluate the brakes anyway before hitting the road with it. All the while doing the rear section of the frame, through all the delays, I kept reminding myself that the front would go quickly. 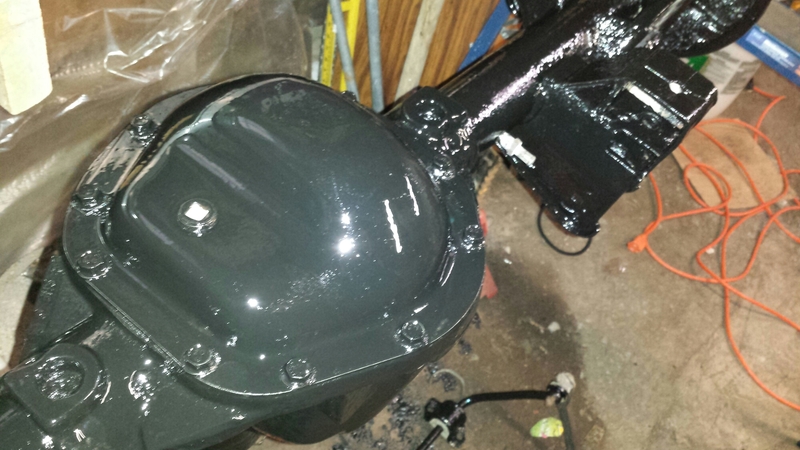 After all, I had little more than to unbolt the axle, clean everything up and paint it, then start reassembling again. But then I unbolted the steering box. Yes, that is a big rip in the frame where the torque from steering oversize tires tried, and nearly succeeded, in pulling the steering box right off. I initially considered a simple fix and simply accepting that the life span of this frame would be somewhat more limited than I thought. In the end though I settled on a proper fix. The catch came next. The steering box mount is a simple but fairly precise piece. 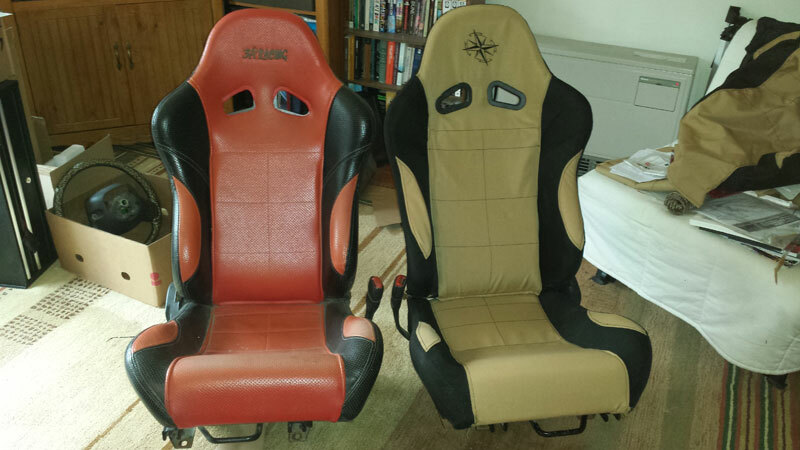 It would take some work to build one from scratch in my somewhat limited shop. 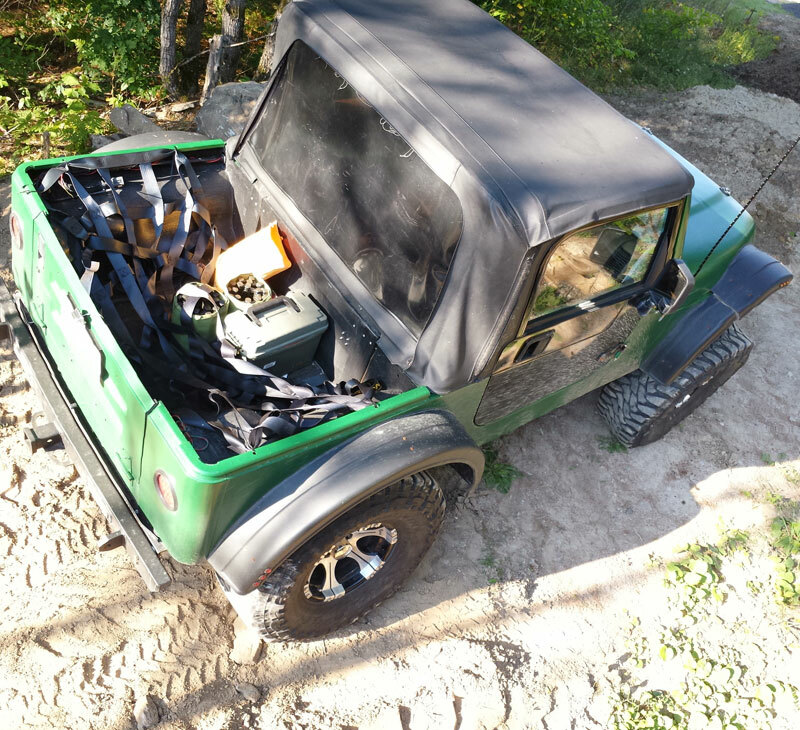 So my first step was to look to the online parts catalogs where I found no end of ready to bolt on steering box mounts for Jeep CJ’s and YJ’s where this seems a fairly common problem – but no where could I find a TJ mount. Maybe I’m just ahead of the curve on this problem. So I started taking some measurements and let my inner engineer come out to design a new, stronger steering box mount and sent the plans off to a friend who runs a machine shop known for doing the impossible with great precision. With that part out for production I’m again at a bit of a stand still on the Jeep, but after wire brushing and cutting off the factory steering box mount it was pretty clear that this was the only route to go. 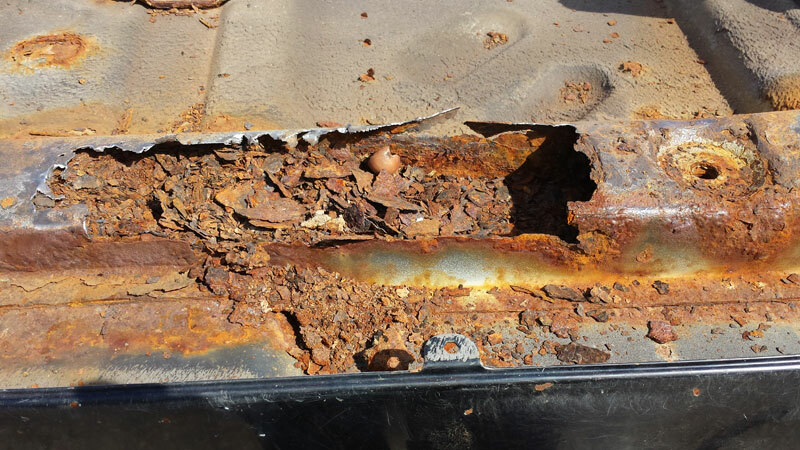 Given the amount of material missing, you really have to wonder how it is that this truck passed a safety certification just before I bought it. 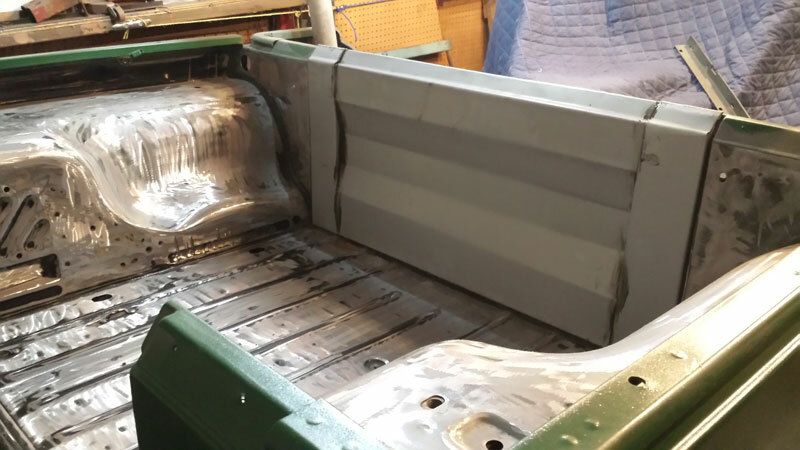 In the mean time, I’m starting some work on the body tub – it needs some attention to the floor supports before moving on to where the truly custom work begins. Other than that, I’m thinking that this project needs a proper name but haven’t found one I like yet – any ideas? For about two years now a project has been slowly forming in my head to build my version of the ultimate adventure truck. 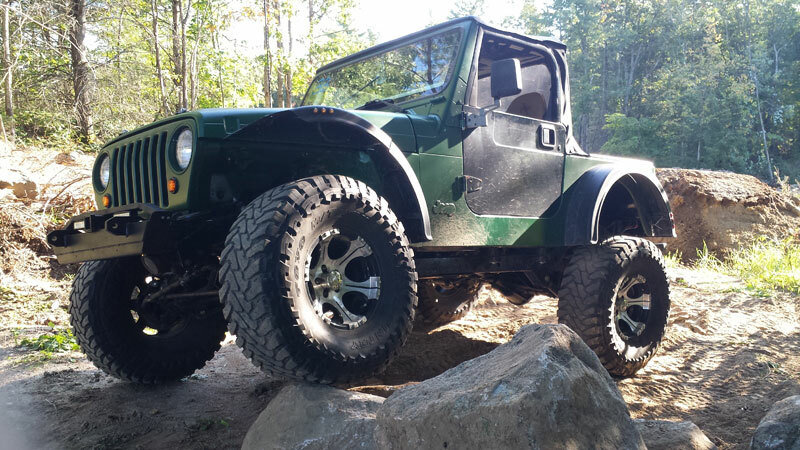 I knew it would be based on a Jeep TJ platform for that trucks adaptability and off road capability along with its simple, repairable design and wealth of cheap parts. However I wanted the flexibility of an open bed pickup for small loads as well as the ability to load bikes and gear low where they’re not getting smacked off trees on the way in to adventure. 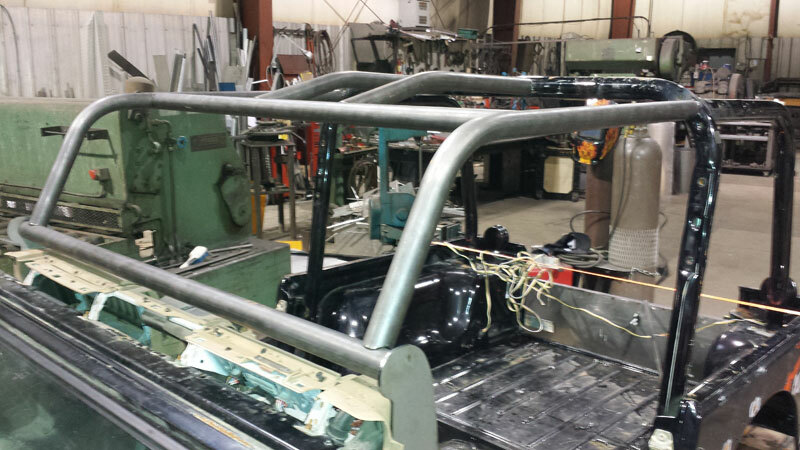 So pretty early in the design process I knew I’d be building a custom top and roll cage to create the ultra short bed Jeep pickup that isn’t currently available on the market (though it’s recently been promised by Chrysler for 2018 so I guess I’m just ahead of my time). 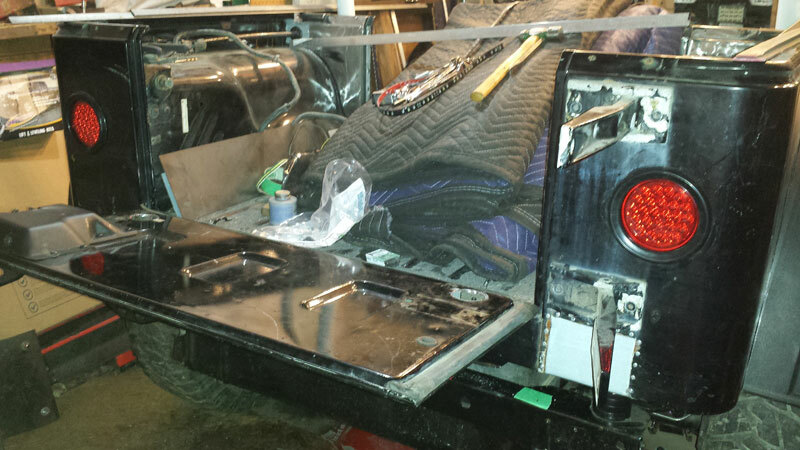 The bed would have a hard tonneau top and truck logistics racking to make it easy to add or remove cargo baskets, spare fuel tanks for the way-back country, and two bike racks. And just to make it stand out a little more while eliminating Jeep’s rust prone fenders, I’m going to cut the stock fenders off entirely in favour of some perfectly round fenders more often seen on tractor trailers. With some creative trimming it’ll give the truck a design nod towards the classic Kaiser and Power Wagon heavy military trucks. 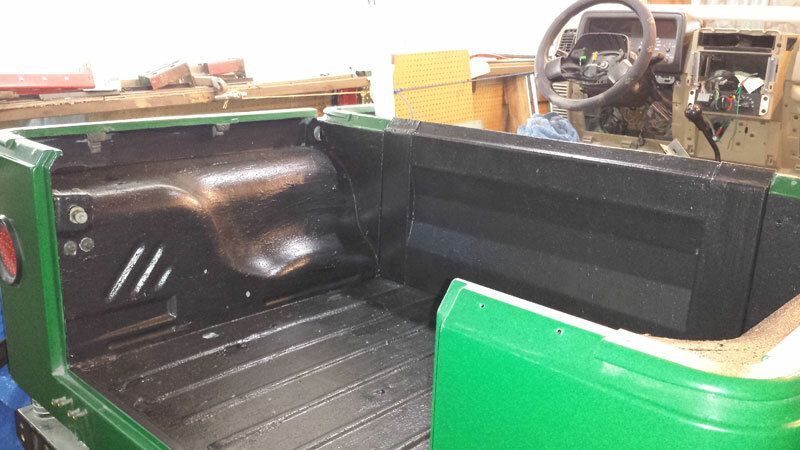 Inside there will be a nearly completely customized dash. This is not only to make room for the extra electronics, lights, power, and recovery equipment, but also my custom head unit. Instead of a conventional radio I’ll be repurposing an android tablet. 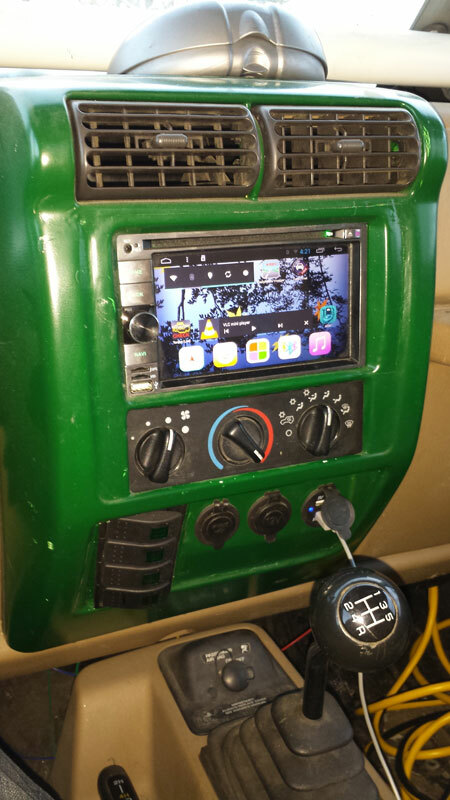 Besides the required mp3 player this will also put navigation, a full set of guages and diagnostics, and a copy of the service manual within easy reach at all times. So why am I bringing all this up now? This past weekend the project took a huge step forward. I purchased the truck that all this is going into back in the fall – but as you can see from the photo above it needed a little work. The previous owner got their license on a Thursday, picked up a freshly certified truck on a Friday, and had spun it into a tree on wet pavement before the end of the work week. Inexperienced drivers and short wheelbase vehicles can be dangerous. 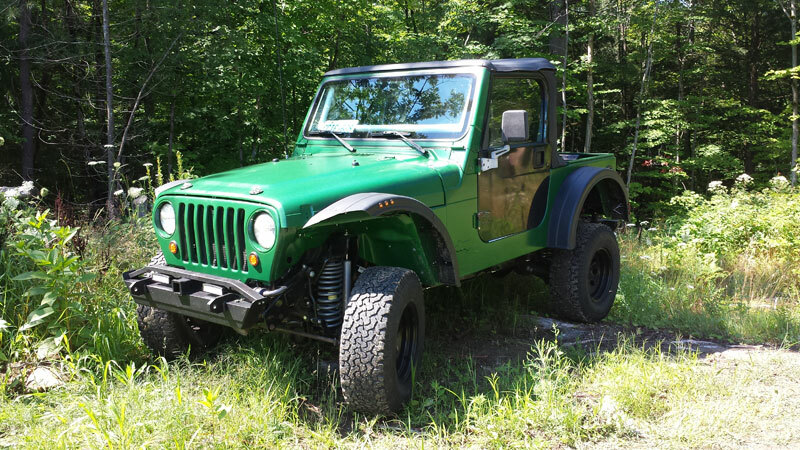 For me, however, here was a Jeep Sahara with the upgraded drivetrain that had been freshly gone over and certified and only needed some body work. 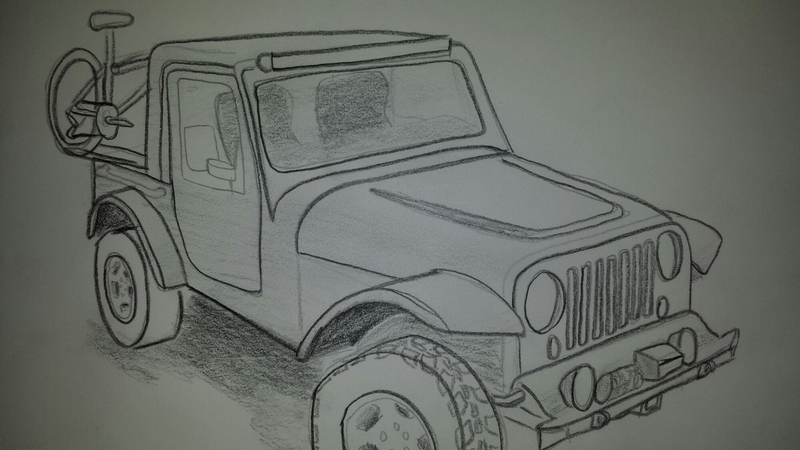 It just so happens I already had another TJ with a good body that needed some undercarriage work. A match made in heaven it would seem. 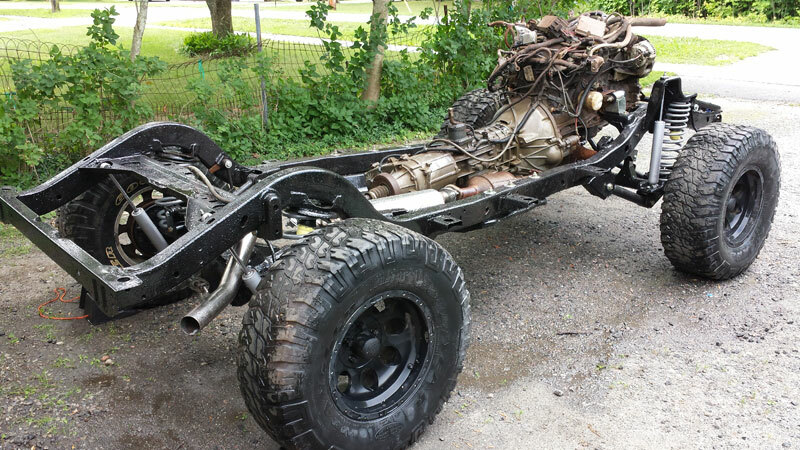 After a couple weekends of ripping and stripping in my spare time I had the truck down to a near bare frame – just where I wanted to start. Since I’d need to reach this stage in a body swap, and with some of my upgrades to near this stage even with a new truck, it made sense. 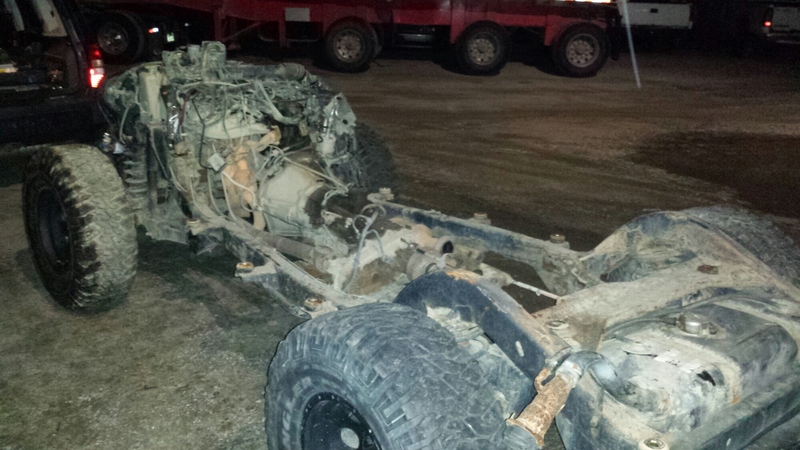 As it looks today the rear end is even more bare. But it’s the perfect time to go over the frame and clean it up to be worry free for years to come. As well as an amazing time for some undercarriage upgrades. I have a shiny new performance exhaust kit as well as a 3″ suspension lift and 1″ body lift for the truck. The goal is to put some more air between me and the ground for when the trail disappears but not so much as to hurt on road drive ability or need major component upgrades. I also have some new adjustable control arms to milk more articulation and control out of my truck. Up to this point however the project has been nothing but destruction and spending on parts. That’s where this weekend was key. 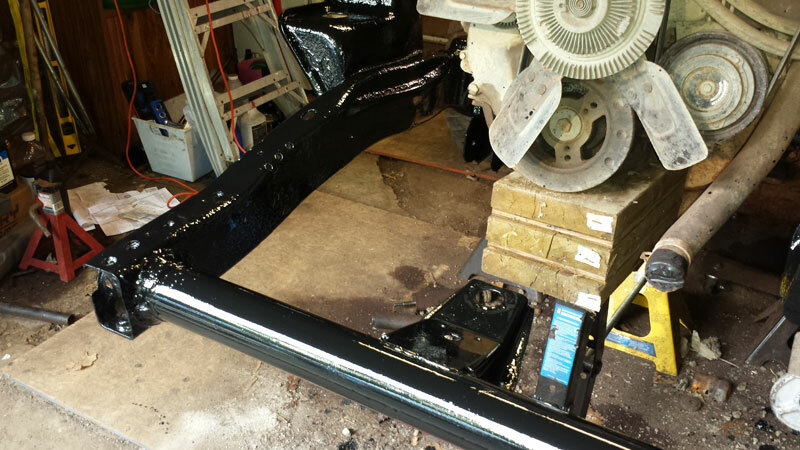 At long last I finished the process of destruction and put a fresh coat of paint on the rear axle finally beginning the process of creation. Not many jeepers can say that their axles are so clean that they shine grey under a photo flash instead of black…but now I am one of them. Keep watching for more as the project evolves but so far what do you think of my latest brain child? 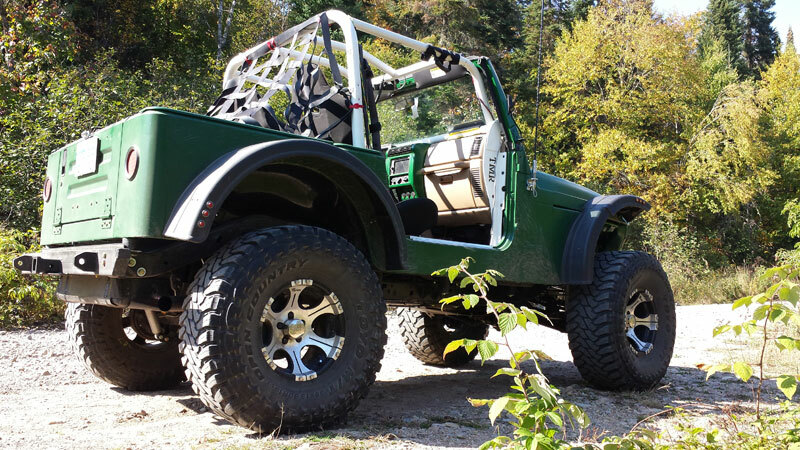 You are currently browsing the archives for the Adventure TJ Project category.